The Deluxe style nurses watch is a quality quartz Japanese time piece secured with a pin fastener and sturdy link strap. Ideal for hospital use or as a gift. Can be supplied with customised logo if ordered in quantity. The Dark Purple Silicon nurses watch is a quality Japanese time piece encased in a one piece silicon shroud. The device is secured by a pin fastener. The time piece can be removed for cleaning and the silicon cover can be disinfected making this watch ideal for situations where infection control is an issue. Can be supplied with customised logo if ordered in quantity. 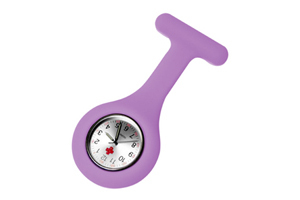 The Lilac Silicon nurses watch is a quality Japanese time piece encased in a one piece silicon shroud. The device is secured by a pin fastener. The time piece can be removed for cleaning and the silicon cover can be disinfected making this watch ideal for situations where infection control is an issue. Can be supplied with customised logo if ordered in quantity. The Pink Silicon nurses watch is a quality Japanese time piece encased in a one piece silicon shroud. The device is secured by a pin fastener. The time piece can be removed for cleaning and the silicon cover can be disinfected making this watch ideal for situations where infection control is an issue. Can be supplied with customised logo if ordered in quantity. The Orange Silicon nurses watch is a quality Japanese time piece encased in a one piece silicon shroud. The device is secured by a pin fastener. The time piece can be removed for cleaning and the silicon cover can be disinfected making this watch ideal for situations where infection control is an issue. Can be supplied with customised logo if ordered in quantity. 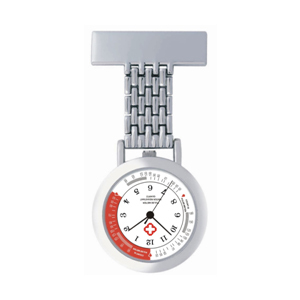 The Red Silicon nurses watch is a quality Japanese time piece encased in a one piece silicon shroud. The device is secured by a pin fastener. The time piece can be removed for cleaning and the silicon cover can be disinfected making this watch ideal for situations where infection control is an issue. Can be supplied with customised logo if ordered in quantity. The Royal Blue Silicon nurses watch is a quality Japanese time piece encased in a one piece silicon shroud. The device is secured by a pin fastener. The time piece can be removed for cleaning and the silicon cover can be disinfected making this watch ideal for situations where infection control is an issue. Can be supplied with customised logo if ordered in quantity. The Light Blue Silicon nurses watch is a quality Japanese time piece encased in a one piece silicon shroud. The device is secured by a pin fastener. The time piece can be removed for cleaning and the silicon cover can be disinfected making this watch ideal for situations where infection control is an issue. Can be supplied with customised logo if ordered in quantity. The Dark Green Silicon nurses watch is a quality Japanese time piece encased in a one piece silicon shroud. The device is secured by a pin fastener. The time piece can be removed for cleaning and the silicon cover can be disinfected making this watch ideal for situations where infection control is an issue. Can be supplied with customised logo if ordered in quantity. The Green Silicon nurses watch is a quality Japanese time piece encased in a one piece silicon shroud. The device is secured by a pin fastener. The time piece can be removed for cleaning and the silicon cover can be disinfected making this watch ideal for situations where infection control is an issue. Can be supplied with customised logo if ordered in quantity. The Lime Green Silicon nurses watch is a quality Japanese time piece encased in a one piece silicon shroud. The device is secured by a pin fastener. The time piece can be removed for cleaning and the silicon cover can be disinfected making this watch ideal for situations where infection control is an issue. Can be supplied with customised logo if ordered in quantity. 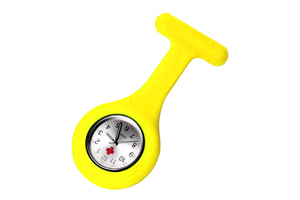 The Yellow Silicon nurses watch is a quality Japanese time piece encased in a one piece silicon shroud. The device is secured by a pin fastener. The time piece can be removed for cleaning and the silicon cover can be disinfected making this watch ideal for situations where infection control is an issue. Can be supplied with customised logo if ordered in quantity. The Magenta Silicon nurses watch is a quality Japanese time piece encased in a one piece silicon shroud. The device is secured by a pin fastener. The time piece can be removed for cleaning and the silicon cover can be disinfected making this watch ideal for situations where infection control is an issue. Can be supplied with customised logo if ordered in quantity. The Black Silicon nurses watch is a quality Japanese time piece encased in a one piece silicon shroud. The device is secured by a pin fastener. The time piece can be removed for cleaning and the silicon cover can be disinfected making this watch ideal for situations where infection control is an issue. Can be supplied with customised logo if ordered in quantity. 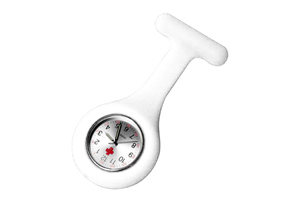 The White Silicon nurses watch is a quality Japanese time piece encased in a one piece silicon shroud. The device is secured by a pin fastener. The time piece can be removed for cleaning and the silicon cover can be disinfected making this watch ideal for situations where infection control is an issue. Can be supplied with customised logo if ordered in quantity.